The Intact Centre on Climate Adaptation (Intact Centre) is an applied research centre with a national focus within the Faculty of Environment at the University of Waterloo. The Intact Centre works with homeowners, communities, governments and businesses to identify, and reduce, the impacts of extreme weather and climate change. Read their brochure to learn more. Restoration of Banks and Shorelines. While the two projects under the Empowering Landowners category were educational, the projects under the other two categories involved the application of flood risk mitigation measures. A featured project is the Across Canada Workshop Series: Showcasing British Columbia’s “Water Balance Model Express for Landowners”. 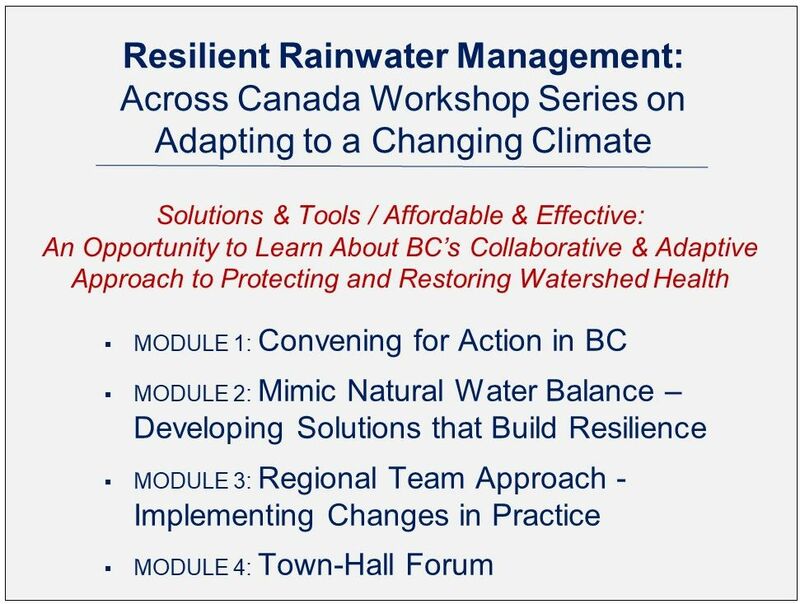 In 2014, the Partnership for Water Sustainability in British Columbia led the Across Canada Workshop Series on Adapting to a Changing Climate. Workshops were held in Calgary, Toronto, Ottawa, Montreal, and Halifax. The Express is an online tool. “ In recent years we have seen a dramatic rise in insurable losses related to extreme weather events in Canada, and we have seen insurance payouts average $1.8 billion over the past nine years, up from an average of $400 million just a decade prior,” reports Dr. Blair Feltmate, Head of the Intact Centre on Climate Adaptation at the University of Waterloo. 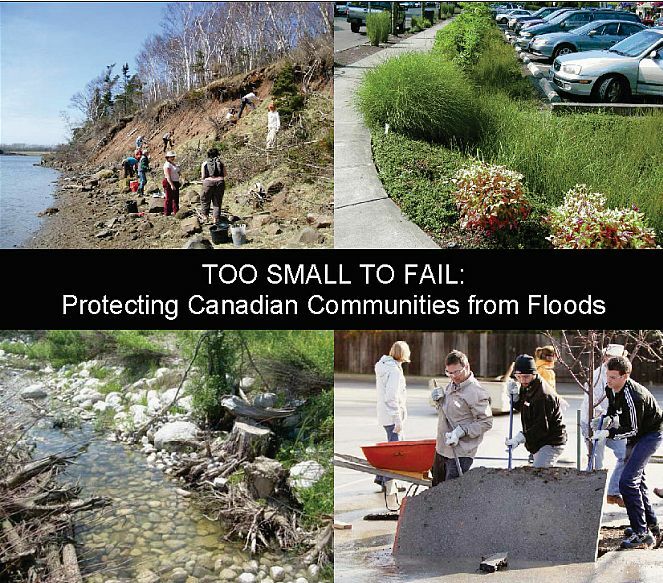 “The lesson of this report rests with its focus on the utility of small-scale, local flood mitigation projects. Attention is often directed to large-scale initiatives that are deemed ‘too large to fail’, meaning that their collapse would cause catastrophic and irreparable damage,” continues Blair Feltmate. The concept of “Shifting Baselines” has relevance in helping to understand why drivers for “Resilient Rainwater Management” differ across Canada’s diverse landscapes. To help inform knowledge-sharing via the Across Canada Workshop Series, the Partnership for Water Sustainability in BC released a backgrounder titled Creating the Future in BC: Recognize and Address the “Shifting Baseline”. Coined by Dr. Daniel Pauly of the University of British Columbia, the phrase Shifting Baseline Syndrome describes an incremental eroding of standards that results with each new generation lacking knowledge of the historical, and presumably more natural, condition of the environment. Each generation then defines what is ‘natural’ or ‘normal’ according to current conditions and personal experiences. “The Across Canada Workshop Series undertaken by British Columbia’s Partnership for Water Sustainability engaged over 266 people in four provinces, the majority with municipal governments, successfully spreading the word about relevant online tools homeowners can take to reduce flood risk on their property,” reports Dana Decent.